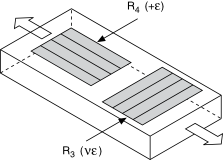 The following figure shows how to position strain gage resistors in an axial configuration for the half-bridge type I. The following figure shows how to position strain gage resistors in a bending configuration for the half-bridge type I. 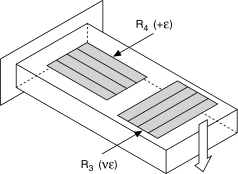 Two active strain gage elements, one mounted in the direction of axial strain and the other acting as a Poisson gage and mounted transverse, or perpendicular, to the principal axis of strain. Completion resistors which provide half-bridge completion. Sensitivity to both axial and bending strain. Compensation for the aggregate effect on the principle strain measurement due to the Poisson's ratio of the material. R1 is the half-bridge completion resistor. R2 is the half-bridge completion resistor. R3 is the active strain gage element measuring compression due to the Poisson effect (–ε). R4 is the active strain gage element measuring tensile strain (+ε). VEX is the excitation voltage. RL is the lead resistance. VCH is the measured voltage. The following equation converts voltage ratios to strain units for half-bridge type I configurations. where Vr is the voltage ratio that virtual channels use in the voltage-to-strain conversion equation, GF is the gage factor, v is the Poisson's ratio, RL is the lead resistance, and Rg is the nominal gage resistance.